Many Concordia students are praising the promoter of the wildly successful Ironic Nazi Party, calling the event a brutal critique of the decadence and moral stagnation of Western civilization. 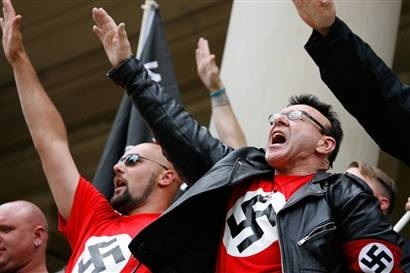 “Montreal’s first Ironic Nazi Party was so much fun,” says reveller Justin Tresblanc. “It was really transgressive and edgy. I hope it becomes a regular thing." Revellers spent the night dancing to the nazi beats of DJ Hatesampler and his merry band of fascist provocateurs. That discomfort was exactly what event organizer Jordan Smith hoped to achieve. “We’re not really Nazi sympathizers,” says Jordan. “Our event is ironic. We threw a Nazi themed rave to shine a light on how oppressive liberal democracy is. The party itself was an act of performance art in which we reinterpreted the conformity of Nazi era Germans through a post-modern lens. At the end of the day, our party was meant to show how modern Canadians are worse than Nazi era Germans."